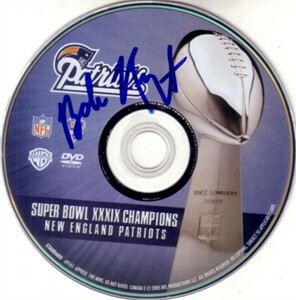 New England Patriots Super Bowl 39 Champions official DVD autographed in blue by owner Robert (Bob) Kraft. Includes original mint condition DVD case. NOTE: DVD is still playable. Obtained in person at the team hotel in San Diego several years ago, with certificate of authenticity from AutographsForSale.com. ONLY TWO AVAILABLE FOR SALE.